Hope is a dangerous thing. It’s election day in America, and there are many earnest, well-meaning people out there dreaming of a blue wave. The polls say Democrats should take back the House, should swing a bunch of governor’s races around the country, and should have a non-zero shot at the Senate. But many of us also remember 2016, and how the polls were dead wrong. We remember the knot in our guts as it all went pear-shaped. And even as we look at early voting numbers in Texas and think, “whoa, Beto is going to win!” (guilty as charged), don’t forget how anxious Democrats in 2016 fought off panic by saying, “yeah, but just wait until the Detroit vote comes in!” Be careful: Hope makes you vulnerable, and we learned two years ago what it feels like when you spend a night, and then a week, and then a couple years choking on that stillborn hope. I’m not saying you should eradicate all hope tonight—that’s impossible—but I am proposing a different way to watch the midterms. Below, I will list 15 of the most vile Republicans running for office, but only those Republicans who have an actual chance to lose. Some of them may win, but some of them are definitely going down, and my suggestion to you is that instead of watching election night with broad, take-back-the-Senate dreams in your head, you instead revel in the fact that at least a few very bad people are going to bite the dust. Then, you’ll have something to celebrate! What follows is a murderer’s row of vile Republicans, prominent and obscure, who have a very real chance of eating dirt on election night. Brian Kemp, Georgia: Let’s start with the man who is pulling out all the stops to steal the gubernatorial election in Paste’s home state of Georgia. Kemp is the current Secretary of State, which means he’s in charge of all things voting, and if you thought he’d recuse himself in the interest of propriety, boy would you be wrong! Not only has he refused to step down from his position (even in the case of a recount, and even though Jimmy Carter himself implored him), but he’s fought right up until election day to disenfranchise, deceive, and game the system in any way imaginable. Kemp’s big gambit was to put 53,000 voter registration applications on hold because of “exact match” criteria, and it won’t surprise you to learn that 70 percent of that number were black citizens. There’s also the usual gerrymandering and closed polling places, hundreds of thousands of names mysteriously removed from the rolls, and on Sunday, baseless accusations of Democrats hacking the election. This guy his terrible. Kris Kobach, Kansas: If you liked Kemp’s “running for Governor while acting as Secretary of State” act, but wished you could see what it looked like in the Midwest, then baby, you’re going to love Kris Kobach. As Jeffrey Toobin so delightfully noted on CNN, Kobach has spent his entire life trying to disenfranchise minority voters, and not just in Kansas. He’s actually the guy who seems to have planted the idea in Trump’s brain that illegal immigrants gave Clinton the popular vote win, and was briefly on Mike Pence’s voter fraud task force before it collapsed. In Kansas, he’s tried everything to keep potential Democrats from voting, from requiring “proof of citizenship” to closing polling places to BS voter fraud alarmism. It affected 35,000 voters, and it got so bad that he was yelled at by a federal judge and ordered to take continuing education classes on election law, and his own (Republican) governor asked him recuse himself from his Secretary of State position. Rick Scott, Florida: Though not quite as flamboyantly corrupt as Kemp and Kobach, Scott—a Senate candidate, and current governor—uses many of the tricks outlined above and two more that appears unique to him: He’s incredibly slow to restore voting rights for nonviolent offenders or former felons (unless they say they voted for him) and he tried to block early voting at state colleges and universities on the basis that it would…create parking issues. Like Kobach, he got slapped down by a federal judge. Russell Walker, North Carolina: My favorite category of loathsome Republican is the one that’s so loathsome that the rest of the party has to disavow them. Walker won the GOP primary in North Carolina’s 48th House district, and will definitely lose tonight, but that doesn’t take away from some truly vile quotes. Such as: “The jews are NOT semitic, they are satanic as they all descend from Satan,” and “God is a racist and a white supremacist.” In his spare time, he enjoys appearing on the StormFront podcast, suing newspapers for not printing his batshit letters to the editor, and suing to have more Confederate symbols in public. He’s going to lose to a black minister tonight. He retweets Hitler supporters, endorses white nationalists, and doesn't shy away from calling himself a white nationalist. It got so bad that the NRCC stopped funding his campaign. When he's not being racist, he's coming up with great ideas like funding the border wall by gutting Planned Parenthood and food stamps. Among all candidates on this list, he has the best chance to win. John Fitzgerald, California: Fun graf from the NYTimes says it all: ”“Everything we've been told about the Holocaust is a lie,” Mr. Fitzgerald said last week on a radio show hosted by Andrew Carrington Hitchcock, an anti-Semitic commentator who has glorified Hitler. “My entire campaign, for the most part, is about exposing this lie,” Mr. Fitzgerald said.” Great stuff! In a Fox interview the day after the Aug. 28 primary, he said electing Mr. Gillum, 39, could “monkey this up,” which Democrats denounced as a racist dog whistle. (Mr. DeSantis denied that.) News reports exposed how far-right extremists were among the organizers and attendees of some of the conferences he frequented. A white supremacist group targeted Mr. Gillum with offensive robocalls. A campaign contributor apologized for referring to former President Barack Obama with a racist slur, but Mr. DeSantis declined to return his donation. Dana Rohrbacher, California: This guy has been in Congress for 30 years after serving as one of the architects of Regan’s trickle-down economic plan, and in that time he’s managed to toe the far-right line on everything from climate change (he blamed previous warming cycles on “dinosaur flatulence”) to immigration to guns (he was one of the people who eagerly read copy for Sacha Baron Cohen’s “Kinderguardians” program that advocated for toddlers to train with guns). But he’s managed to outdo himself in the past two years—at this point, everyone from the State Department to Robert Mueller to his own House leader, Devin Nunes, thinks he’s on Vladimir Putin’s payroll. Anti-Russia hysteria has gotten out of hand in some corners of the left, but if there’s one guy who it actually applies to, it’s Rohrbacher. Beyond Russia, he said in May that homeowners should be allowed to refuse LGBT buyers. For decades, he’s been the ghoul of ghouls, and he shows no signs of slowing. Hey, at least he’s Jewish so he probably won’t deny the Holocaust! Braun is running for Senate, and his race seems to be a toss-up. Note: An earlier version of this story identified Hunter’s opponent as Muslim. That has been corrected in the sentence above. We regret the error. Scott Walker, Wisconsin: Walker, the governor of Wisconsin, has dedicated his life to busting unions and gutting public education and making life miserable for poor people and nominating homophobic and misogynist judges and eliminating funding for women’s health centers and letting big corporations write their own rules for polluting the air and water, and he is the Koch Brothers’ prize boy (you can imagine their disappointment when he flamed out of the presidential election). Despite this, he has survived two narrow elections and a recall. He became visibly terrified online after a few special election victories for Wisconsin Democrats earlier this year, and now he seems to be trailing Tony Evers in his bid for a third term. 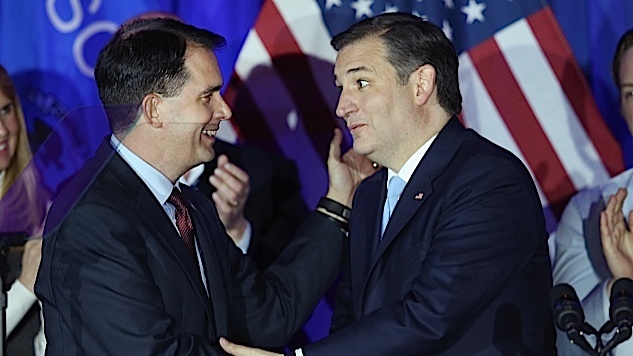 The end of Walker’s political career is almost too good to imagine, but it would be the triumph of triumphs. Ted Cruz, Texas: The easy joke here would be to write “He’s the Zodiac Killer” and just end the post, but that would be going too easy on Cruz. In fact, he’s had a detrimental effect on far more American lives than the Zodiac ever did—this is a person, for instance, who couldn’t bring himself to immediately oppose the child separations at the border even though the man ordering them, Donald Trump, spent an entire campaign calling him a liar and making fun of his wife, and even though Cruz himself is only here because the U.S. granted his Cuban father political asylum. He’s so hard right that no less an eminence than Lindsey Graham, criticizing his own party, had this to say: “If you killed Ted Cruz on the floor of the Senate, and the trial was in the Senate, nobody would convict you.” He’s unlikable, his policies are abysmal, and even in deep-red Texas, he could actually lose. That’s the list. I apologize to all the worthy contenders I had to leave off, of which there were many. To everyone else, stay sane tonight, and let’s hope we go 15-for-15.